In this article We are going to talk about the CRUD system with “PDO” in OOP PHP. Before we are going to take the tour on this article if you don’t know anything about PDO please just follow the link so that you can learn something from that page about PDO. This is the easiest method i think to implement a crud system with pdo. For this you should create the sample table that i’ve created here just copy paste this table. Now it’s time for to explain what we’ve done in here. First of all we create a class called oopCrud & have our hostname, username, password & dbname tobe private as we don’t want to share them with the viewers or others. Now what we see in the constructor method is we’re loading the db in this method so that we can do our works fine by just autoloading the db with the loading of class. Now for the method first we can see that we’ve created a method called “public function showData($table)” here we are going to fetch all the data through PDO & then shown it to the view page. Then there is a method called “public function getById($id,$table)” this method just gets the element by the id we called in the edit page. Then the other method called “public function update($id,$name,$email,$mobile,$address,$table)” here we are taking the values which are to be edited. 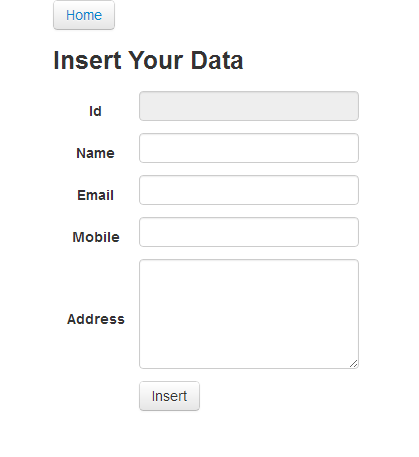 Then method called “public function insertData($name,$email,$mobile,$address,$table)” this is for the insertion of the data. Then the last but the least method called “public function deleteData($id,$table)” this is for the deletion of a row according to ID we’ve sent for deletion. Now it’s time for our view part. First off all we are going to make the data show then insert and after that the edit part. And all these things we are going to do with “Twitter Bootstrap“. So we are going to learn here also how to use this amazing bootstrap thing. It’s nothing else then the other parts. Just taking the values of the current ID by getby() method & seeing to the proper field then when we clicking the update button we’re again calling the method via the object. That’s it. This is where our tutorial ends. If it’s not so friendly please do leave a comment in here so that i can do better than this in the future. Thank you guys for reading this article & stay tuned because I’m going to make a paginataion article on PDO. but there is no “edit.php” file. You meant to put this, right? What I meant to put was “td>Edit</a"
Instead of "edit.php?id=$id" it should be "update.php?id=$id"
No worries! I was just trying to recreate your example but I was getting some errors. stay tuned so that you can have more & great tuts from me ..
thank you for the source file and the knowledge, so help me much..
thanks for your nice comment !! will update many things shortly !! How do I use your CRUD as a backend script to update, delete, create etc. content for the frontend of my homepage (website). Bascally what I am askiing is how do I turn CRUD into a CMS? looking forward for your quest on cms .. 🙂 will defenitely help you in any need ..
it gives some errors… what i can do??? hlo, there is a code for crud in php code by me….. there is a problem in it.. plz help me to solve this…. i have a customers.php file in which i had declare all things.. and for the unit testing i have test.php. the insert function is working.. how the other functions will work??? just call the functions like you’ve called insert function that’s it. for more info please read the full article carefully how it can do it’s work. it’ll give you the idea to implement the code i think. thank you ..
how to call other functions?…. what is the correct code? think that you’re going to update a name or info on your database. so you’ve created update function by which you’re going to update the fetched data. goto the edit page where you’re going to take the request of updating data. when you click submit for update you’ll grab the request by $_REQUEST method then just call your method or function of that class like given in the above code. that’ll do the tricks. thank you ..
dear, plz check that code which i had sent you.. there are 2 files customers.php and test.php. in that case, only the insert function is working not 3 others. plz help me to solve this issue. i again sent you the code. no this is not the correct code .. you need to fetch the information first then you’ve to call the functions. please do check my code again if necessary please download the code that i’ve given you that’ll give you the proper idea. I’m so busy to debug your code right now. Although if you’re unable to solve it after downloading my code & again viewing it let me know hope I can help you if I got any time. Hi Tanim, Thank you very much for your tutorial. I have got now a good understanding related to pdo and crud class. I’ve downloaded the files. But buttons are not working. Can you please tell me what’s the problem, since i dont have a good background in it. 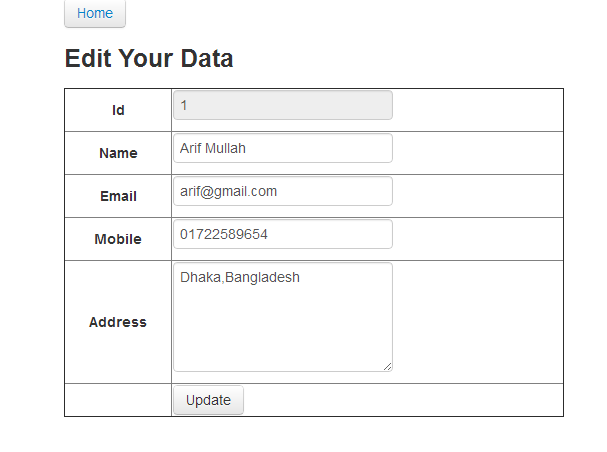 It is made of bootstrap 2 but firefox and ie didn’t support the button check the files on chrome.. Yes its working in chrome. So it means i need to add class btn to anchors to make it work or add button inside anchor. Well anyway i will find it. But Thank you very much again for your response and a great tutorial. I love to see your other tutorials. thnkuuuu so much dear for your help and response. hey thanks dear for ur support nd response. now plz tell me… how to show table detail from database? in here let’s see we’re calling the method to give all the data in the table so that we can show it in the view page. that’s it. First of all autoload the class file then create an object then call the method that’s it. thank you for reading my article so much .. Thanks ..It was much needed… Keep sharing the codes…!! Great tutorial. Everything i very clear. One thing that I have never seen before, could you please explain how the “echo @ <<<show" works. ? Nice code for small app. Still getting into the code. I found in showData() method it is giving error for $data array when it returns null or 0. So adding $data = array(); before while loop might rid off the error. To download the full source code click here. But if I open “show.php” I get to see two link to Home and Insert. and below that the link to Insert New Dates. I understand that there is something include, but not what because php only is no scrips. I have looking again on other site’s at pdo but safe is that not as it stands here, easy to work with though. but you can fill in what you want everything is accepted. I genuinely prize your work, Geat post. Pingback: DPsense Survey Tool – DPsense L.C. Bro please provide link of this tutorial source code ..
previos one is corrupted…or link broken. Assalamu Alaykum Brother, I tried to have the Source Codes zip, but there wasn’t any…..where can I be able to get it? Nice simple, clean and tidy code. But where is the download link, i cannot find in githu either? Can you teach on weekend?